Not my usual style, I must admit, but I had some leftover breadcrumbs from making stuffed peppers and some chicken that needed eating, so I decided that breaded chicken was the way to go. 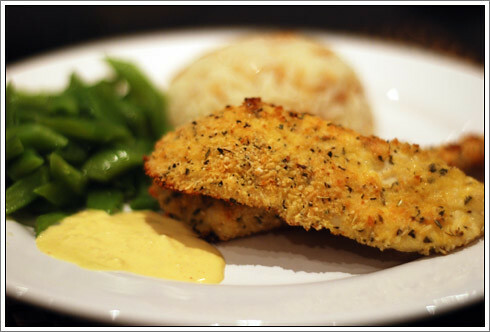 I always forget that when homemade, breaded chicken is miles away from its KFC or supermarket freezer section counterparts, and makes for an impressive yet simple weeknight supper. Great too, as it can be made in advance and quickly grilled when you're ready to eat. I served mine with Turkish-style rice pilaf and homemade garlic and paprika aioli, which worked beautifully. I'll definitely be making this again. Start by preparing the chicken: slice the breast acrossways so you have 3-4 pieces of chicken per breast. Dip each slice into the flour and coat evenly then set aside. Mix together the breadcrumbs, mint, oregano, paprika and parmesan and season with a little salt and pepper. In a shallow bowl, beat together the eggs. Make sure you have a clean plate ready to transfer your breaded chicken onto, then dunk each piece of chicken in the egg, making sure it is fully coated, then dip into the breadcrumb mixture, so that both sides are covered. Place each piece of breaded chicken on the clean plate, ready for grilling. At this stage, you can either keep them in the fridge for up to a day or freeze for another day - I would suggest individually wrapping each piece in cling film so you can take out the number you need without them sticking together. If you're going to cook them immediately, transfer the chicken onto a very lightly greased baking tray, making sure the chicken is laid flat and doesn't overlap. I had to cook mine in two batches as there wasn't room for all the chicken on one tray. Now for the rice - put the stock on to boil, and heat up a dry frying pan ready to toast the orzo. Once the pan is hot, add the orzo and toast for up to a minute. The pasta should change colour only very lightly. Remove from the heat and allow to cool. When the stock is boiling, add the rice and toasted orzo and boil for 11 minutes. When cooked, drain and serve. While the rice is cooking, heat up the grill. Once hot, spray a little olive oil on the chicken so the breadcrumbs go nice and golden, and grill for 5 minutes each side, turning once. You might need to begin this stage a little earlier if, like me, your oven isn't big enough for all the chicken on one baking tray! Once your chicken and rice is cooked, transfer onto plates and serve with some delicious, garlicky aioli. Wonderful!